You’ve found the perfect internship, one that will give you great experience in your field of study. Now, you’re ready to apply. You begin to feel the pressure, after all, you know that a great internship will lead to future job opportunities in your industry. You know you need to write a cover letter, but where do you start? Maybe you’ve already read about how to address a cover letter or learned the best length of a cover letter, but do those same strategies apply to internships? However, when applying for an internship, you probably lack real-life experiences outside of the classroom. That’s why you should showcase the skills you’ve learned in class or through extracurricular activities that make you a great candidate for this internship. It’s important to customize each cover letter for the internship that you are applying for. The structure of your cover letter for an internship should be like the structure of a regular cover letter. Without relevant real work experiences to include, you’ll want to include experiences from school, focusing on your classes and extracurricular activities. Think about what you have recently learned that you could apply to this internship, or how an organization you are involved with taught you leadership or time management skills. These are things you will want to include in your cover letter. 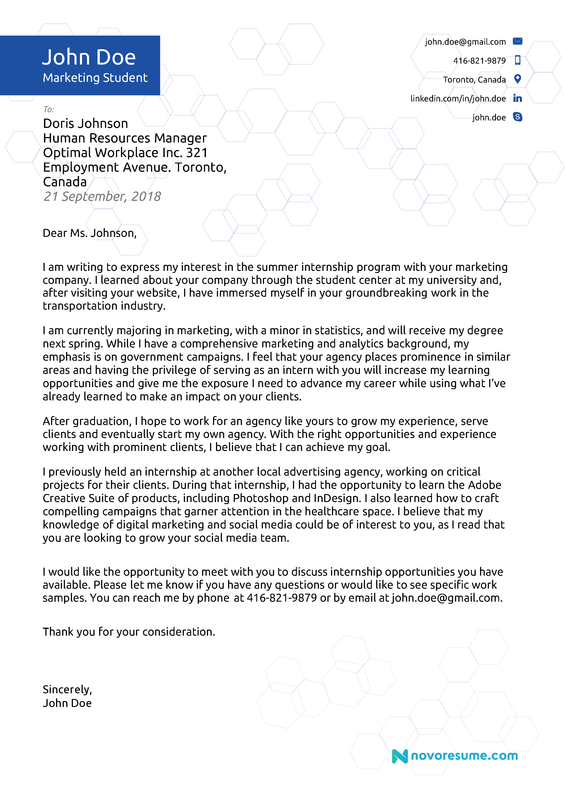 In the opening paragraph, you should describe how you heard about the internship or what you know about the company and demonstrate your interest in the internship. Include relevant information about yourself including your major, education level, and interests that apply to this internship. If you found something interesting about the company during your research, such as an upcoming project that you would like to be a part of, include that as it shows your interest and passion for the company. In the next few paragraphs, you’ll want to review the internship description and highlight a few qualities that make you a great fit for the internship. You can draw from any area of your life. If you have volunteer experience that taught you customer service or played sports that taught discipline and leadership, include that in your cover letter if it is relevant to the internship. Don’t forget to show how your skills can benefit the company, not the other way around. 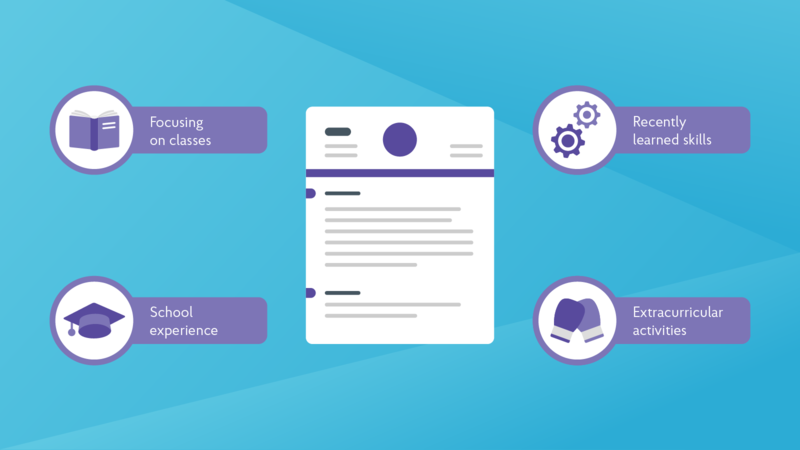 It can be tricky when writing a cover letter for an internship because you’re looking for so much from the company in order to learn and gain experience. But you want to make sure to keep the company’s needs at the forefront of your cover letter. This will set you apart and make you a more desirable choice for the internship. In the closing paragraph, don’t forget to reiterate your interest in the company along with your passion for the industry and your contact information. Your final sentence should leave the hiring manager feeling like your experiences have prepared you for this opportunity, so make sure to end strong. See the cover letter below for an example of skills that can be highlighted in an internship cover letter. While it can be intimidating to write a cover letter for an internship, with these tips and guidelines you will be prepared to land an internship in no time.